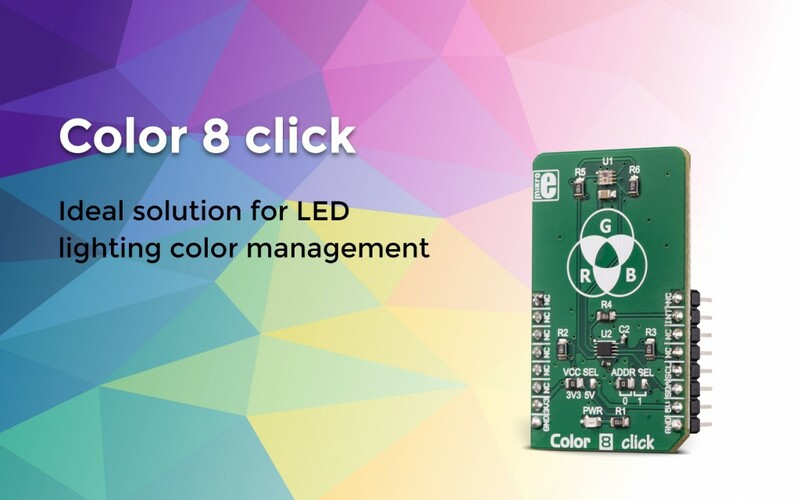 Color 8 click is the newest addition to our sensor Click board™ line. It senses the color by utilizing ROHM’s BH1749NUC, an integrated color sensor IC. The click comes in the package which also includes the mikroSDK™ software and the library with all the functions. The Click board™ comes as a fully tested and approved prototype, making it a reliable device ready to use on the development board. It is perfect for sensing the subtle light changes, as it is equipped not only with the red, green, and blue (RGB) but also the infra-red part of the spectral components, allowing a very accurate measurement of the subtlest changes in light. Color 8 Click board™ is an ideal solution for LED lighting color management, display color correction on mobile devices, TFT display color correction, and other similar applications that require accurate color sensing.